It has been so long since my last post. I have many excuses, not the least of which is the lack of a camera. For a while I was taking pictures on Bobby's phone - but as of May something or other the phone file filled to capacity and it is beyond Bobby or I how to unfill it. Ridiculous and a bit like my parents (no offense Mom or Dad) but true. I would take a close up of Isabelle - crazy curls highlighted from our days outdoors - and show you the space left by her tiny bottom tooth that now sits in an envelope under her pillow. (I keep praying I won't forget to replace the tooth with a dollar bill - how horrible that would be?). She is very proud, and I love to watch her preen in front of our dining room mirror - sticking her tongue in and out of that space. You can actually watch her growing up - it's happening that quickly. My garden, on the other hand, is NOT growing. I guess I would take a picture of that, too - sad little tomato plants, wilted bean stalks, and yellowed cucumber leaves. You've really gotta hand it to those farmers. I could get kind of down about that - and other losses, really. I've been thinking a lot about having another baby. So much so, actually, that I called the dr from the Mayo clinic to see what he thought about another pregnancy. The conversation was anticlimactic. He said he had no idea what to expect as my condition is so rare. I also have been daydreaming about a house on the next street (grass is always greener, right?). It's much bigger and prettier and right across the street from Molly, Troy and the cousins. I ran into the woman who owns it and she said that she would like to sell it in a couple of years...So there I go crunching numbers; planning and wasting time figuring out how we could buy it. Yet in the meantime, I have a great house. While my vegetable garden is piddly, my flowers are beautiful. Blue hydrangeas are blooming, as are three different types of roses, snapdragans, gerber daisies and and lavender. What's more, my brother has discovered that hardwood lies under linolium (which is under carpet). This weekend he pulled almost all of it up and the wood is beautiful! Quite a nice surprise. I would love to have had a picture of him working on those floors! If my camera was working, I would take a picture of my adorable Jane - sleeping in her own bed (no more crib) - looking nothing less than angelic with her white blond ringlets fanned out in a circle on her pillow. I do have one picture. 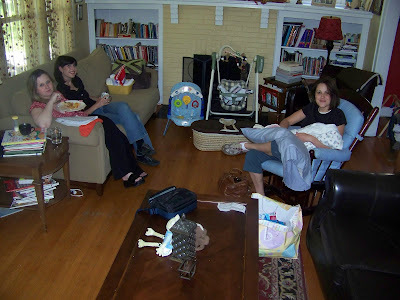 I had the opportunity to stay with my dear friend, Jen, who has recently had an adorable baby boy. Because my little ones are a bit more independent, I was able to go with my best friends to visit sweet Jen. What a gift. Molly took this picture and I like it because sitting there in the midst of good friends, holding a newborn, it reminds me to be content in the moment. Precious Paige- So good to hear your voice, your thoughts, your struggles. Our time together was so rare and blessed. Your friendship is such a gift. Oh Paige, as you know, I am right there with you. I appreciate so much that we can share honestly our struggles and revelations with one another. Thanks for this post. What a sweet and honest post...you know I love reading your thoughts, thank you for sharing them. It was so good to see you and thanks so much for all of your kindess to me. Finn is wondering where Paige is!!! Your struggles are encouraging and I thank you for the honesty in sharing your beautiful self with others. Hi it's just me, me testing something.